Marlo (Charlize Theron), a mother of three including a newborn, is gifted a night nanny by her brother (Mark Duplass). 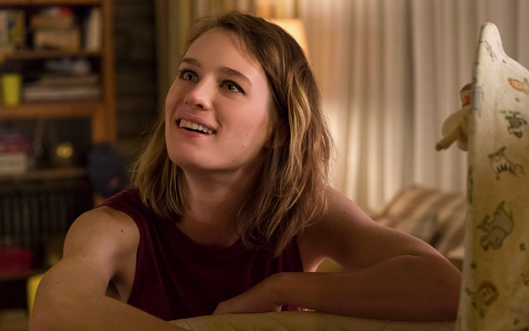 Hesitant to the extravagance at first, Marlo comes to form a unique bond with the thoughtful, surprising and sometimes challenging young nanny named Tully (Mackenzie Davis). Tully is a raw and (brutally) honest depiction of the exhausting challenges of early motherhood. Featuring an outstanding central performance from Charlize Theron, this film (the third collaboration between director Jason Reitman and writer Diablo Cody) is unafraid to look at the darker side of parenting - a disturbing place rarely explored on our screens. Of course, cinema is full of stories about mothers. However, few seem as committed to tackling the crushing combination of sleep deprivation, guilt and monotony as Tully. Cody certainly knows of what she writes. As a result, while this is an undeniably funny film, Tully is also a pretty tough watch. Marlo’s desperation is brilliantly conveyed - distilled into a heartbreaking montage that will likely strike a chord with all parents and, indeed, anyone who has ever felt overwhelmed by life. As insightful as this montage is (and it is genius), another scene stands out for me - an overhead shot of a car stopped in a car park. From the outside, no one would ever guess the turmoil within. And this is the point. No one truly sees the strain that Marlo is under. She ends up feeling like a failure because she cannot be everything that everyone expects her to be. She cannot reach that 'perfect mother' ideal. Yep, it’s heartbreaking alright. Theron smashes her performance out of the park. We already know that she is a brilliant, incredibly versatile actor. However, she surprises us once again in Tully. This is very much an ‘Oscar-worthy’ portrayal. Marlo is as relatable, sparky and intelligent (with many of the brilliant flashes of razor sharp wit that we have come to expect from Diablo Cody) as she is exhausted and desperate. As a result, we really like Marlo. It is as much of a relief to us as it is to her (and her rather clueless husband, Drew, played by Ron Livingston) when she takes up her brother’s offer of a night nanny. Enter Tully - the embodiment of everything Marlo wants to be and the help she actually needs. Brilliantly brought to life by Mackenzie Davis, Tully injects joy and hope into this film - and into Marlo’s family. A decent night’s sleep is a powerful thing indeed. I loved Marlo and Tully’s increasingly intimate and heartwarming relationship. For me, it spoke to the power of female friendship and support - something that has saved many a new mother. Tully also represents the importance of seeking help, the benefit of accepting assistance. Just as we are starting to enjoy the beautiful friendship between Marlo and Tully, Reitman and Cody pull the rug out from underneath their movie. It is an unexpected and not entirely welcome move. The film’s final act takes a series of increasingly strange turns before forcing us to rethink all that we have seen. I have to admit that I am still unsure how I feel about Tully’s narrative development. Having played this ending over and over in my mind, I am left feeling confused, slightly cheated and also rather impressed. It would have been easy for Tully to follow a simpler, more linear path. Instead, Cody has taken a risk - one that is meant to jolt us into a reassessment of our own perceptions of motherhood. Viewed in this way, Tully’s ending is extremely effective. A fitting conclusion to all the themes that have been explored. I now want to watch this movie a second time with the third act in mind. Thanks to Theron’s astounding performance, this is an experience I more than welcome. Have you seen Tully? If so, what did you think about this film? Did the ending work for you? Let me know by leaving me a comment in the section below or let’s chat about the movie over on Twitter. You can find me @500DaysOfFilm.